Watch passengers closely as they stand around airport departure screens trying to pinpoint which gate their flight leaves from. They will stare for at least 30 seconds before they find what they need to know, and if the airport did its job well they’ll walk away (hopefully) in the right direction. But the right direction for passengers is not necessarily the right direction for airports. Send a passenger to their boarding gate too soon and they won’t spend in stores. Send them too late and they will miss their flight. And when an airline’s goal is to get passengers to the gate (often an hour in advance), ready, prepared and listening to endless announcements about cabin baggage limitations, how can airports ensure a passengers dwell time is maximised? A passenger who knows they have time to use the free charging desks, call the office, download the latest episode of Mad Men and still have time to order a coffee is a customer who’ll appreciate their airport visit more than a customer twiddling their thumbs at the gate. Boarding gates breed anxiety and the longer a passenger stays away, the better their experience will be. Sydney Airport and many others are solving the problem by sending live flight updates to passengers through their iPhone and Android apps. It’s a great way to communicate offers at the same time as reminding them where they need to be. Indoor wayfinding apps are also helping passengers in large airports, giving them context of where they are located in the terminal, what’s nearby and what’s on the way to where they’re headed. Yet both solutions rely on a passenger having already downloaded the app. 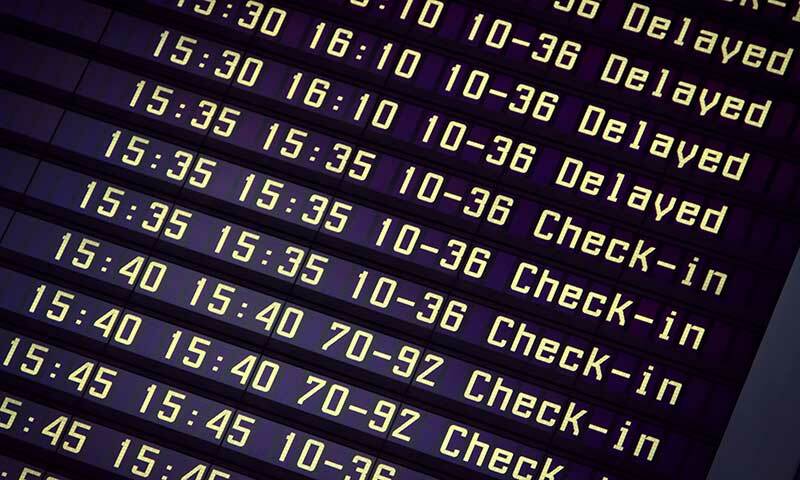 How do we use flight information display systems (FIDS) to reach the masses? Auckland nails it with their “Relax” status on their FIDS. London City Airport does similar with “Wait in Lounge”. Travellers, especially those new to flying, need a little reinforcement that it’s okay to pull up a seat or browse duty free. And what if airports took it a step further and each FIDS screen showed you the time to the gate from that very spot you were standing. And as you passed screens closer to the gate those screens would show the time from that location. I’ve not been to Athens International Airport but they look to be doing something similar. Tell customers to relax (or better yet, download an eBook, learn to say “Hello” in Japanese because the flight is departing to Narita, or text a friend they haven’t spoken to in ages). Airlines might control the schedules, but airports can use FIDS to shape passenger experience in the terminal. When we think about maximising dwell time the tendency is to think big, with elaborate digital-heavy plans, when in fact the answer might be staring us (and our customers) right in the face. 0 Comments on "Flight departure screens can be personal too"